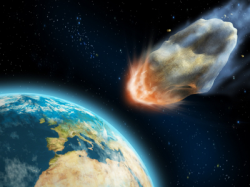 So today I decided to send a comet on a collision course with earth. A comet that sneaked in behind the sun where noone can see it. And suddenly it was there heading straight for us. In 4 minutes and 34 seconds after you press play, it is all over. What are you going to do the last 4:34 minutes you have left?